I ordered her on Tuesday (Happy Birthday to me!) and she arrived this afternoon. I can’t wait to share her with you, so let’s get in to this review! Alivia seems to be a play on Olivia. She comes in the little sister/family style box. 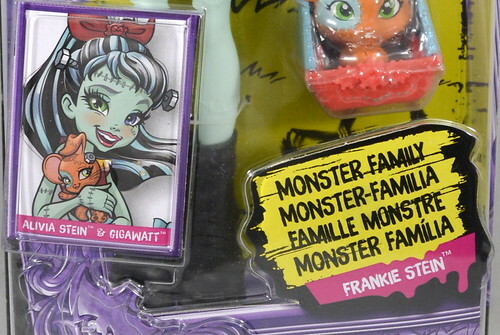 I thought it was odd at first that the box has Frankie’s name on it, but then I noticed that it said Monster Family, so this must be them reaffirming that they are in the same family. The art on these boxes is so cute! Again, we are seeing the multiple language boxes, which just means to me that they aren’t doing different versions for international and domestic releases. 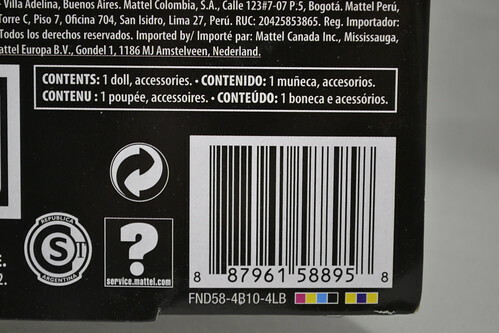 Here is that magical barcode if you need it. I doubt any stores are going to be carrying her, as we’ve already seen the Target and Wal-Mart reset for Spring 2018. But who knows? Alivia’s face is just adorable! She has heterochromia like her sister, but her eye colors are opposite of Frankie’s. My doll’s eyes are slightly off, but I can’t really describe it. I still think she is cute, so it doesn’t bother me. She wears some slight blush and red lips. Her scar is on her left cheek (opposite of Frankie’s). Her eyebrows are a nice grey color. I noticed this while I was feeling her hair texture, but Alivia has a molded on scar on her forehead that is hidden by her bangs. This is an interesting feature that I almost missed. Alivia wears her hair in a ponytail with triangular bangs. 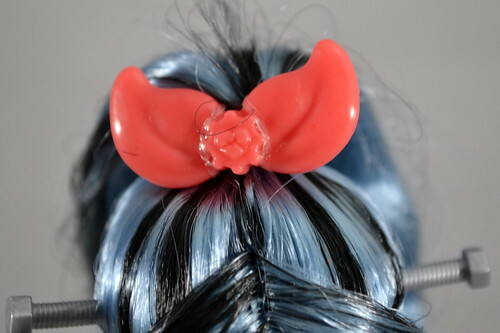 She wears a red bow in her hair with a sprocket and heart piece in the middle. 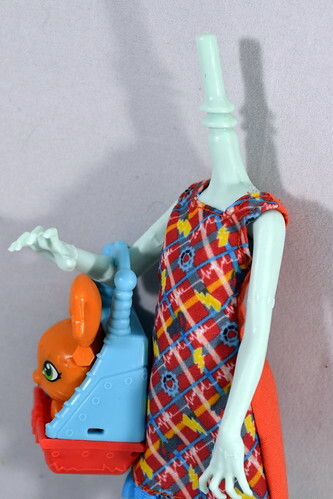 Alivia has bolts that come out of her head, unlike Frankie’s bolts in her neck. It reminds me of a cute little girl with pigtails, so I think it works. 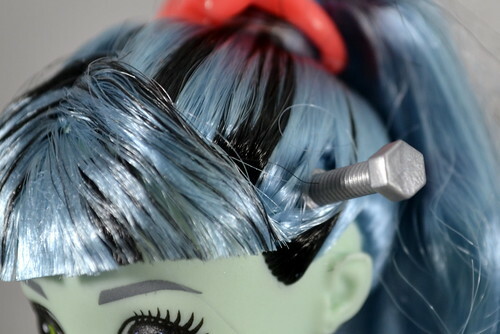 The bolts are just plastic and feel like they could be removed fairly easily, but there would be a large hole in her head (like Viperine and her snakes) if you were to remove them. Alivia has light blue hair with black streaks. 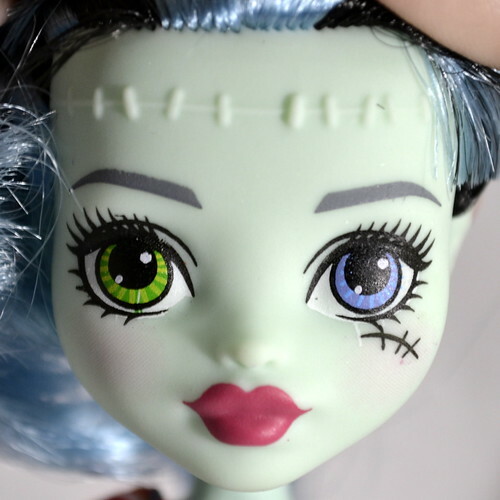 This is different than Frankie’s white hair with black streaks (or does she have black hair with white streaks?). It’s an interesting choice and I kinda like it. 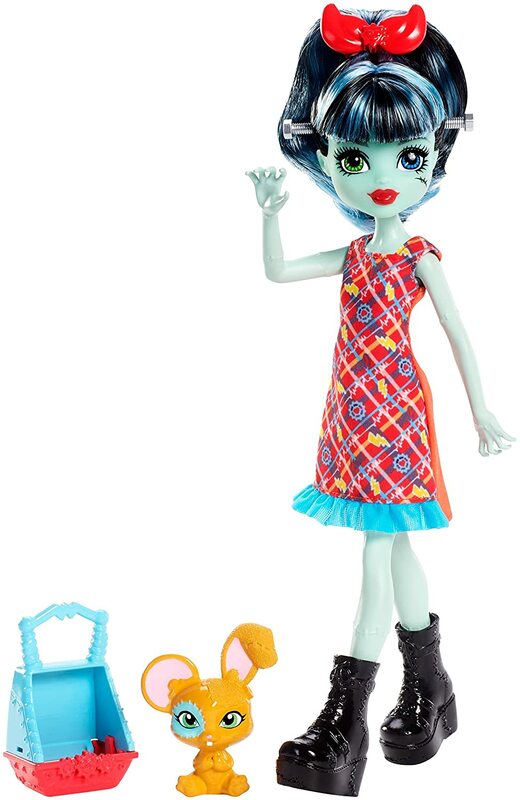 The doll wears a one piece dress with a plaid style print on the front. The dress has a blue ruffle trim. On the plaid I can see lightning bolts, the same cog/sprocket/heart from her bow on her head, an outline of what looks like a mouse (? ), and white electric pulse waves. It’s a cute dress…. …. But the pattern is only on one side. It closes in the back with velcro. Her boots are all black with no paint. 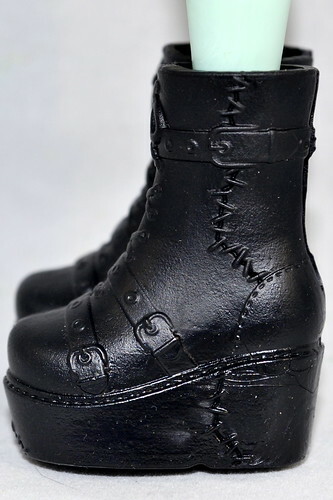 They have buckles and platforms. 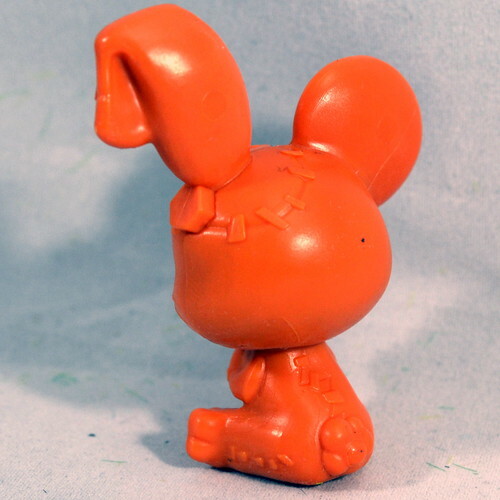 They also look like they were ripped and stapled back together, a very frankenstein style look. You can kind of tell by the shape of the boots that this little sister is different than the others we had gotten. Alivia has very large more flat feet. 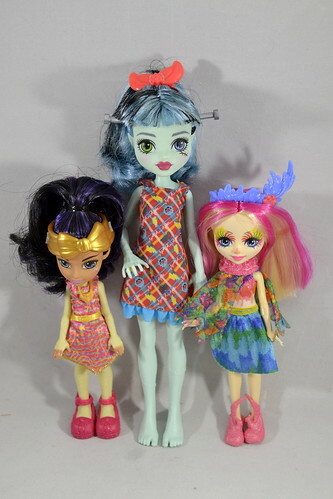 Compare this to Howleen’s first releases which had feet exactly like the older teen dolls, except they were slightly scaled down. I think this is an interesting choice for this doll. Alivia stands slightly taller than the newest little sister dolls. 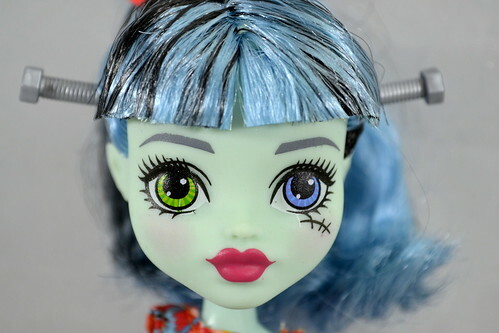 It would have been smart for me to compare her to an older Howleen doll…. yeah… maybe I’ll add that later…. I decided to compare her to her sister, Frankie, though. 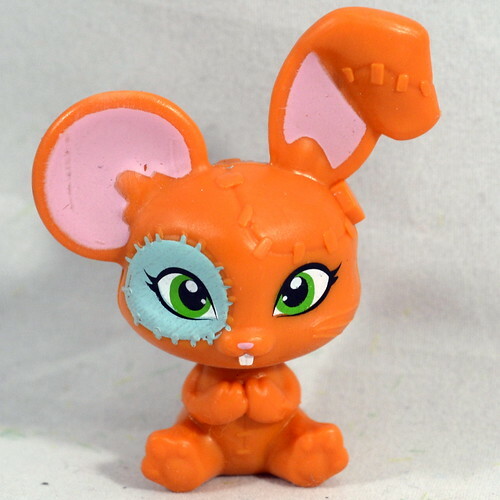 This is a reboot Frankie from the new signatures line. 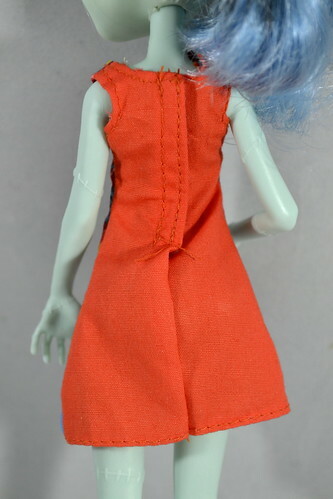 (Her dress is from a seller on Etsy named Haunt Couture) Alivia is a slightly different color than the reboot Frankie. She’s almost a little more blue. She comes up to Frankie’s shoulders in height. So I guess we need to discuss the elephant in the room. Yes, this doll is not very articulated. Yes, she lacks elbows, wrists, and knees. It is so sad to look at how adorable this doll is and wonder what she could have been. There. I said it. I think the artists at Mattel did a decent job of making this look more like a little sister and not just like a shorter doll. By giving her less arched feet and a different torso, you really get the sense that this doll represents a younger character. This picture also shows off just how much more blue Alivia looks than Frankie. Frankie almost looks grey here. This doll was made in Indonesia with a copyright date of 2016. 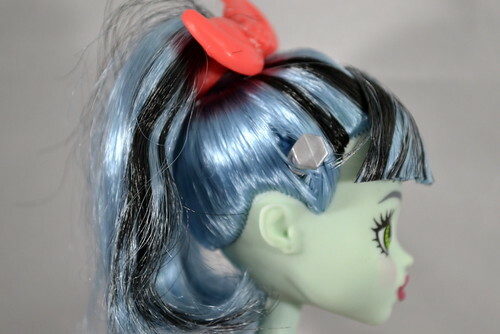 Like many of the new budget or lower articulated dolls, Alivia’s head had some problem tilting to the side. I decided to go all Lizzie Hearts and OFF WITH HER HEAD! This is the same peg system that the budget dolls have been using lately. This peg system does not allow for much tilting motion and explains why she can only shake her head no, not turn inquizitive to the side. Her pet Gigawatt comes in a carrier that she can hold. 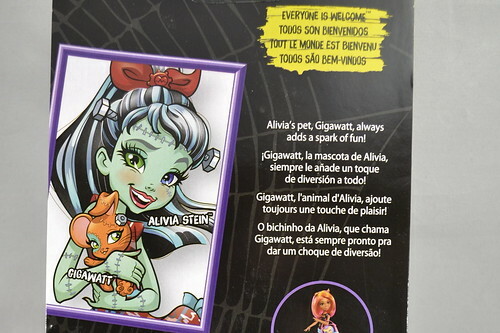 Unlike Frankie, who originally came with a diary to explain her pet, Gigawatt is left up to your imagination. He/She has orange skin/fur with one bunny ear and one bear (?) ear. I thought you might like to see the two pets compared. 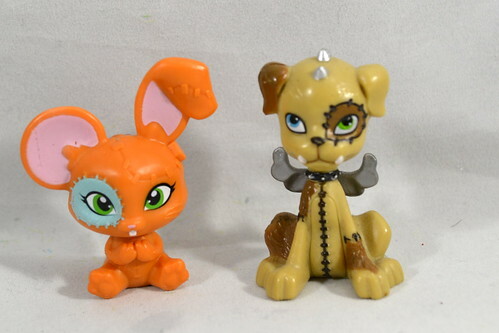 *sigh* not to beat a dead horse… but just look at the difference between something like the original pet and then what we have gotten used to. What about you? Is there enough here for you to want to buy her? Or are there just too many things more that you would want that this stops you from taking the plunge? I am SUPER curious to know what people think of her and if anyone else thinks she is worth getting! Previous PostNew Ever After High Dolls on Amazon!Next PostNew Youtube Video! I was excited that they made her, but livid over the fact that she doesn’t look like her movie self in the least. I could even handle the youthification if her a hair was right, she had her glasses & the lines along her limbs, and that outfit. 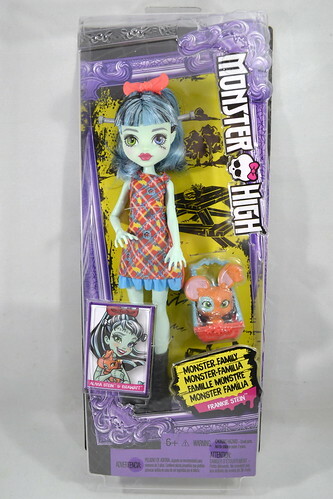 Ive never wanted to wear a monster high fashion so much as i do what should have been Alivia’s stock. Your review is excellent. I can really appreciate the details she does have. She’s really like a whole new character. I have yet to see her irl in a shop. But im sold. Do you know if there are any skin tone matches for a rebody? Lorna perhaps (yay lil sis and let’s get some articulation back!) Or the eah featherly pixie?